hen the US Army asked for a "weight-carrying" flying machine, the Wright Company responded with the Model C. It could carry a useful weight of 450 lbs. while climbing at 200 feet per minute and remain in the air for four hours. The six-cylinder motor was much more powerful than previous Wright engines, and for the first time they used carburetors -- twin Zeniths, one for each set of three cylinders. Other engineering first included water-cooled heads on the cylinders and and a muffler. The muffler, however, was optional. Physically, the Model C looked very similar to the Model B. The most striking difference was the blinkers. While the Model B had triangular blinkers angled back along the front skid struts, the Model C, had large vertical rectangular blinkers. 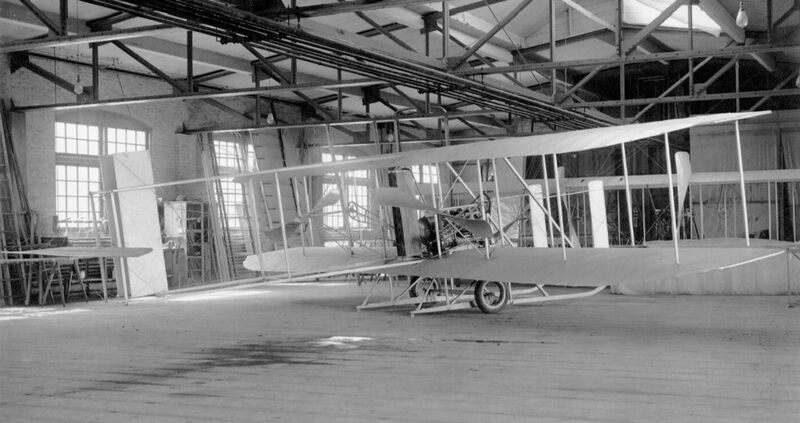 The wings were slightly shorter and flatter than the Model B. The rudder was slightly taller. The aircraft also offered true dual controls, so both left and right seat pilots used their right hands on the warp/rudder control. Although a few C's were built with the older Wright 4-cylinder motor, most had the powerful new 6-cylinder motor. The additional power and the resulting speed made them difficult to handle and they got a bad reputation among Army pilots. After several pilots died in crashes of Wright Model C and Curtiss pusher airplanes, the Army banned pushers in late 1914 in favor of the new-style tractor airplanes with enclosed fuselages. McFarland, Marvin W. (ed), "The papers of Wilbur and Orville Wright." McGraw-Hill Book Co., New York, 1953, p 1201, plate 212. Loening, Grover C., "Takeoff into Greatness." G.P. Putnam's Sons, NY, 1968, pp 66-67.